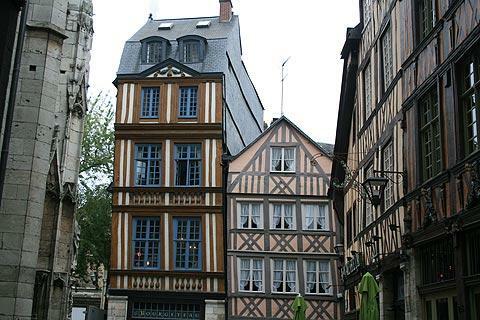 Rouen is a large town, and capital of the Upper Normandy region, situated in the Seine-Maritime department. The town is classified as a ‘City of Art and History’ and has more than 200 protected sites. Unfortunately a great deal of Rouen was very badly damaged during the second world war, but extensive reconstruction has taken place to rebuild the medieval old town and Rouen also contains a number of noteworthy monuments including an impressive cathedral - famously painted by Monet on many occasions. The cathedral is undoubtedly the highlight of a visit to Rouen, despite its many challenges over the last few centuries: the cathedral we see today is third cathedral in the same location (nothing remains of the first, but the crypt from the second is part of the current cathedral). It was then very badly damaged during bombing in April 1944 after which it was close to collapse. Happily the cathedral was saved and has undergone major renovations since that time. It is the ornate facade with highly decorated entranceway and two towers that is the main feature of the cathedral, although the 156 metres tall iron spire (added to the lantern tower in the 19th century) might catch your eye first. Inside the cathedral, the light filled nave, the stained glass windows, the effigy of Richard the Lionheart, the staircase to the library and the Lady Chapel are among the features of interest. Monet painted 30 pictures of Rouen cathedral, attempting to capture the building in all different light and weather conditions, as one of the most impressive series of impressionist paintings. 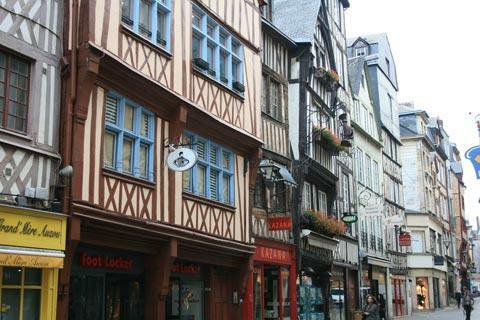 Wandering around the old centre of Rouen you will discover fabulous half timbered buildings on almost every street. 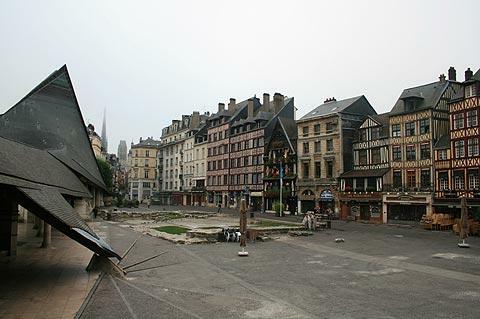 Start your visit to the old town in the Place du Vieux-Marché: beautiful and filled with tourists now, this was actually the square where Joan of Arc was burned to death for heresy. There are some more particularly impressive examples of medieval houses around the Church and Cemetery of Saint-Maclou and around the Church of Saint-Joan, and in Rue Saint-Romain and Rue Eau-de-Robec. The church of Saint-Maclou is built in the 'flamboyant gothic' style and is very attractive. 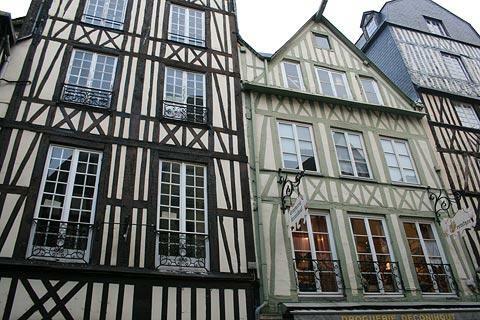 Nearby you can see the Aitre Saint-Maclou, the church cemetery that dates back to the time of the Great Plague. 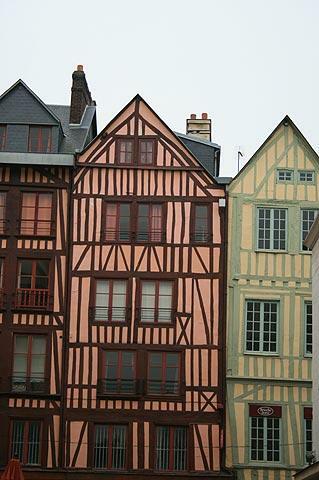 Have a look at the buildings to see carvings evoking death and the mummified cat. The buildings now house the School of Fine Art. 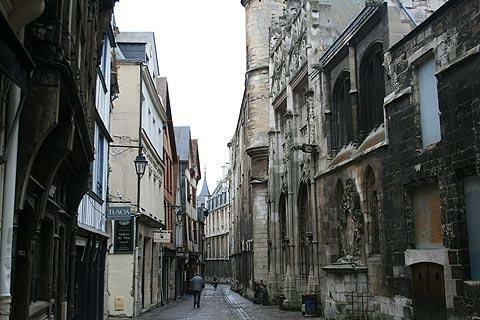 The church of St Joan of Arc has a completely different appearance to much of historic Rouen. 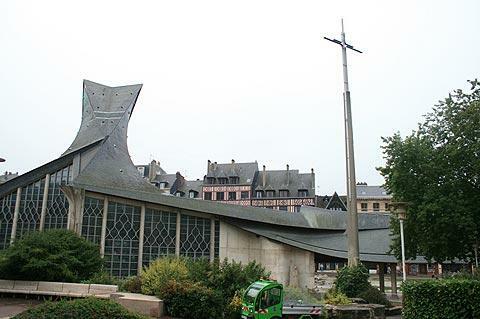 This modern church has been built on the site where Joan of Arc was burnt at the stake. The large cross stands on the exact spot, with the church next to it. The strangely shaped slate tiled roof is supposed to represent the flames (it has quite a dragon-like appearance to my mind). Next to the church the roof sweeps away to cover the food market and the ensemble is quite a contrast to the wood and timber buildings on the other side of the square. 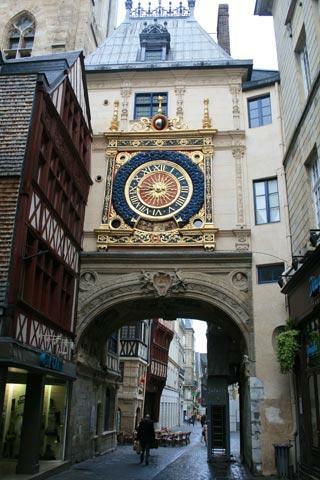 From here the Rue du Gros Horloge takes you to the Great Clock housed in a Gothic Belfry with a Renaissance archway. The street is charming, and pedestrianised with lots of shops and the clock is spectacular. The astronomical clock also shows the phases of the moon dates from the early 16th century. 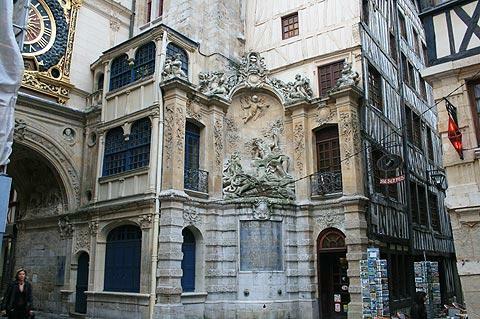 Another remarkable building in Rouen is the Palais de Justice. This building almost has the air of a cathedral it is so beautifully decorated on the outside. It has been restored since the war but certain parts have been deliberately left exposed as a testament to the bombardments the city suffered during its liberation by the allies. 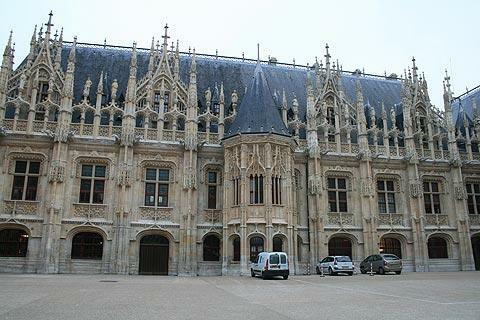 The Palais de Justice is the largest civil building in the gothic style in France. You can also see the impressive Abbey Church of Saint-Ouen, and the Joan of Arc Tower where Joan was imprisoned and threatened with torture. If you want a change from all the history, you can visit the Jardin des Plantes which has an extensive range of gardens and plants as well as water features - mostly in the formal French style. The gardens are about one kilometre south of the town centre (the other side of the Seine river). 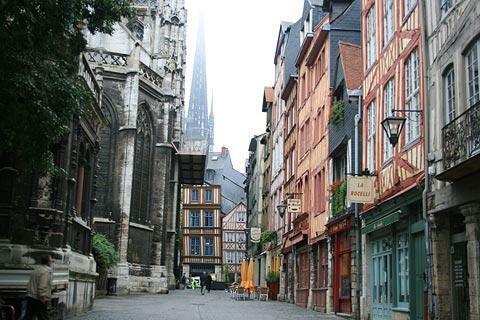 There are several museums in Rouen, including a Museum of Fine Arts (with an important display of Impressionist Paintings) and a Museum of Ceramics (historically an important product in the town). Gustave Flaubert (who wrote Madame Bovary and Salambo) was born in the town, an event commemorated as a museum in the house where he was born. 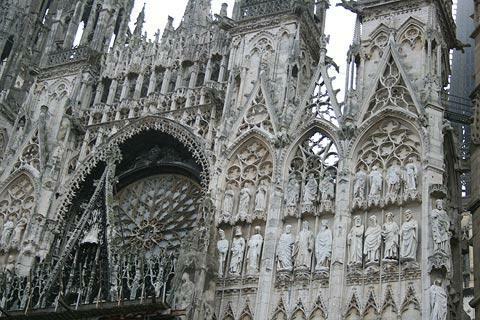 Rouen’s Natural History Museum is second in France only to that of Paris and has an impressive collection of artefacts. 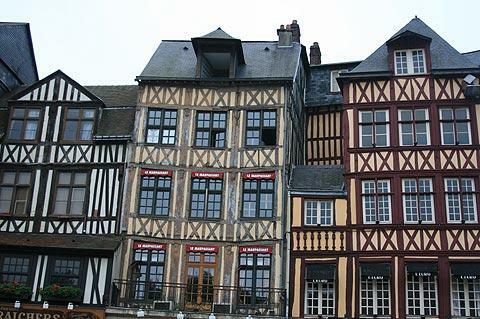 There are several places and attractions close to Rouen that you will want to visit while you are in this region. Our favourites include the abbey at Jumieges, the picturesque village at Lyons-la-Foret and Chateau Gaillard at Les Andelys.